Reviews: most popular type of blogpost? I was looking for new blogs to follow and I turned to wordpress Explore Topics which is nothing more than a tag cloud, obviously aggregated from all the wordpress.com blogs. Now, the tag with the bigger size is “Reviews” which is an interesting insight. Are reviews really the top reason why people blog or is the bigger proportion of blog posts about reviews? This means that out there a treasure of data mining is awaiting to be discovered. From time to time, I like to write a kind of how-to or tip post, usually a result of tweaking the tools and services that I use. Here is a little one for wordpress. If you have used before an open source CMS, what you probably are missing in wordpress is the media manager functionality that the likes of Joomla have for ages now. Well, the truth is that you shouldn’t, because it is there, only not too obvious. First of all you have the Media Library under the Manage Tab in the WP Administration, but, guess what, this is only for viewing the media you have uploaded, and, despite the name of the file executed to show the library (= /wp-admin/upload.php), there is no way to upload from this screen, which I find kinda odd. 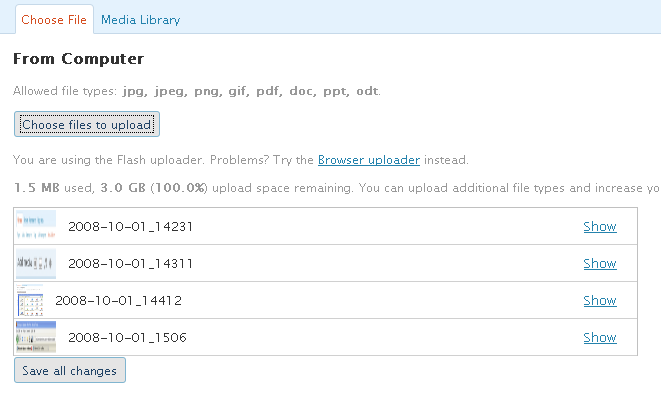 So, the only place to go when you want to upload something, is the Write tab, which displays the editor. On top of the editor there are these little buttons that allow you to insert images, audios or videos in a post. Which is all we need, one might think, unless you want to do some mass uploading of, say, images that you might use later in a series of posts or different pages without risking of posting things accidentally. This url can take some extra parameters, the most important being the type one, e.g. But if we use the plain url, without any arguments, in a browser address bar of another window or tab, we open the familiar upload pop up as a separate page. Bookmark this address to have it handy. You can use it as a media manager, which is what we were looking for in the first place. For mass uploading select the media files from your disk (Ctlr + right click for each pick), as in the picture below, hit the button and..
one by one, the media find their way in you library. You can’t use this separate page to insert media directly in a post though, which is a safeguard from accidental posting. It is also needless, since you have the media buttons on top of the editor, anyway. Let me start by stating that I love wordpress. I love it as an open source project, as a blogging platform, as a business model (.com, that is) and as a community, in general. 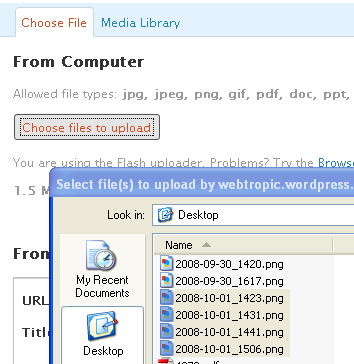 I started working with WordPress in September 2006. By the February of 2007, I already wanted to migrate to my own hosted installation. I run one ever since but, yet, for this blog, I chose to return back to .com. The support for plugins is critical. There are so many of them out there, I am sure someone can make your wildest blog dreams come true. The downside is that you have to take care of updating and upgrading, figure out how to deal with high traffic, malevolent attacks and lots of other things that keep a sys admin awake at night. Ok, maybe I am exaggerating a bit, but, certainly, one has more work to do with a hosted wordpress. When I decided to start this blog, I wanted to avoid this extra hassle. I have my greek blog to experiment with, it works fine, I am happy with it, but that’s about it. Doubling the hours I spend for sys admin tasks, won’t make me a better blogger. With wordpress.com you get a limited number of themes, most of them not to my taste, but with an extra 15$ per year you can buy the CSS upgrade. Having access to the css file, allows you to play a lot with a theme’s look and feel. It is not a trivial task, but lots of people with a little guidance may utilize the option. Most will find it easy enough to change fonts and colors while, with a little bit of extra effort, some borders, paddings and margins can be tackled too. A CSS guru, playing with positioning, dimensions, background image properties etc, can make the theme look entirely different from the original. 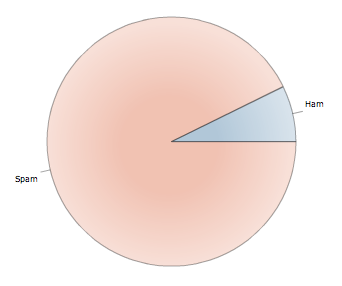 To learn CSS, you can start here. WordPress.com gives 3Gb of storage space per blog and, given the falling prices of storage,I predict this is going to go up. Yet, this amount of storage suffices for one to live his whole life and never ‘consuming’ it, provided he follows a clever media storing tactic : upload images and photos to the likes of flickr, picasa or imageshack. Upload videos and sound file to any video hosting site. While wordpress.com supports only Youtube, Google Video and DailyMotion for the time being, there is one more extremely useful option (still beta): vodpod. comes in two flavors: as a firefox plugin (it didn’t work with FF3 though, till the time of writing) or as a simple bookmarklet. With the vodpod you can insert any video in the wordpress editor. So, if you have lots of videos of your own, first choose a video hosting site, upload the videos there, and then with vodpod embed them in your posts. Check my post with the video of Matt and you will see that it is actually coming from blip.tv. Saving media in external sites is a good practice anyway. Avoids single point of failure. If I choose to export the blog and transfer it elsewhere, the media links will work immediately without having to move a single file. Now, this is a tricky one. Most bloggers would like to have a feedburner chicklet to display their feed subscribers. Provided they have a feed ‘burned’ in feedburner, this is perfectly feasible with wordpress.com: you can copy the chicklet code in one of the text widgets provided and it will work nicely. The problem is that, in this way, you do not actually redirect your feed to feedburner. Two feeds exist seperately: the default one, and the one constructed by feedburner, which meanr that there are two different feed urls also. To have a unified feed would require an plugin such as that one is not allowed to install. Remember? No plugins can be installed by users in wordpress.com blogs. This means that your standard wordpress feed address is still there for people to use and will ‘lurk’ underneath the feed icon in the address area or a toolbar. Those subscribed to the standard wordpress feed will not show in the feedburner chicklet. There are no technical means to remedy this (not to my knowledge, at least) but one can apply some psychological techniques: use a feed icon of your own (same process as the chicklet above) and place it as close to the top of the page as possible. Grab the attention of the visitor. 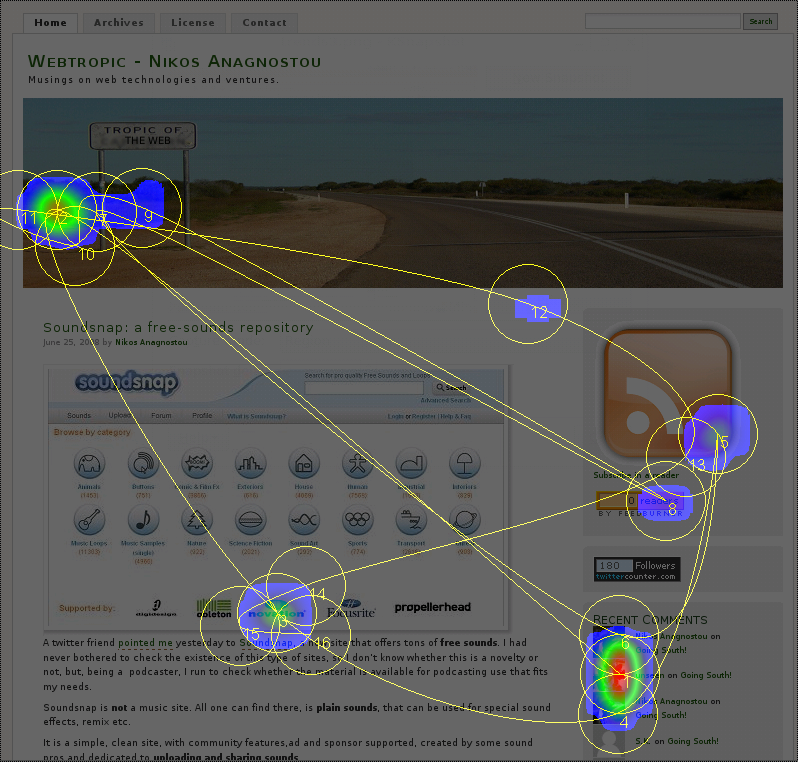 You can perfom a heatmap test to check whether your feed icon is visible enough. Use feng-gui to produce a heatmap. Here is an example of mine. That’s about it. Tell me whether you found it useful.